Moscow, Russia (CNN) -- Making it to the top as a prima ballerina takes a lot of work, strength and time -- and, says, Svetlana Zakharova, "a lot of emotions." The 33-year-old Russian has been prima ballerina, or principal dancer, with Moscow's prestigious Bolshoi theatre company for nearly a decade and her presence on a cast list is guaranteed to fill any theatre in London, New York or Paris. Zakharova's grace and stage presence belie her difficult, and sometimes lonely, journey to the top. Born in the historic, north-western city of Lutsk in Soviet-era Ukraine, Zakharova's mother sent her away to train at the age of 10 -- first to Kiev, then at St. Petersburg's esteemed Vaganova Academy of Russian Ballet. "It took me a few years to get used to the ballet," she said. "My child's body was not ready to handle such loads, and the legs that were used to walk upright had to be twisted and the back always had to be held straight. It was a huge strain and I did not have the strength." It was an unhappy period in the young Zakharova's life. She says that she would find herself crying "all the time" between the conveyor belt of exams and rehearsals. Only when, as a teenager, her body grew tall, strong and athletic did she begin to see how her future might pan out. "When I was about 13 or 14 ... I really realized that I wanted to become a ballerina," she said. From then on she practiced everyday, often for up to eight hours solid. She says she didn't miss out on the usual freedoms of childhood: "I cannot say that it was a sacrifice," she said. "I do not even think about it." Revealingly, she wouldn't wish the same experience for her own daughter, who was born in February 2011. "I cannot imagine myself giving her away to study in a different town," she said. "I asked my mum, 'Why? How did it happen?' And she said, 'You know, even until now I can not understand what I was led by -- it must have been something from above.'" Zakharova graduated from Varganova Academy in 1996, aged 17, and immediately joined the Mariinsky Ballet -- one of Russia's preeminent ballet companies -- and a year later was promoted to principal dancer. In the seven seasons that followed, she learned the bulk of the company's repertory, including the great classical roles of Giselle, Odette-Odile in "Swan Lake" and Aurora in "The Sleeping Beauty." Despite growing national acclaim -- she was awarded one of Russia's highest artistic accolades, the Golden Mask, for two consecutive years at the turn of the millennium -- she was getting itchy feet. "I worked in the Mariinsky theatre for seven years, and I danced the whole classic repertoire there, and the contemporary repertoire," she says. "But all of a sudden I started to realize that I was not developing any more. Day in, day out it was the same and the same -- and suddenly I wanted to change something." That change came in a dramatic move to Mariinky's main rival, the Bolshoi ballet company in Moscow, known for it's "grander, more expansive style," according to Britain's Daily Telegraph newspaper. Zakharova hasn't looked back since. With the Bolshoi she has traveled the globe and in 2007 she was awarded the Russian State Prize for outstanding achievement in ballet. Next year she is scheduled to perform at Milan's renowned La Scala opera house, where she will dance Giselle. Success, though, has not eradicated a persistent grain of self-doubt. Even now, as she enters her 15th year as a professional dancer, Zakharova still regards herself, for the most part, as a student. "When I'm in rehearsal I always feel like I'm a pupil -- and not at all a ballerina" she reveals. Indeed, it's only in those comparatively brief moments on stage that Zakharova says she truly believes in herself as a performer. "This transformation is unique," she explains. "Something from within takes place and you understand sometimes that human abilities are limitless. During the performance you do such things which you completely did not expect from yourself." Whatever it is that envelops her on stage, the feeling is addictive. Zarkharova has been dancing almost everyday since the age six and now finds it hard to imagine what the future will hold when, one day, she will have to hang up her ballet shoes for good. 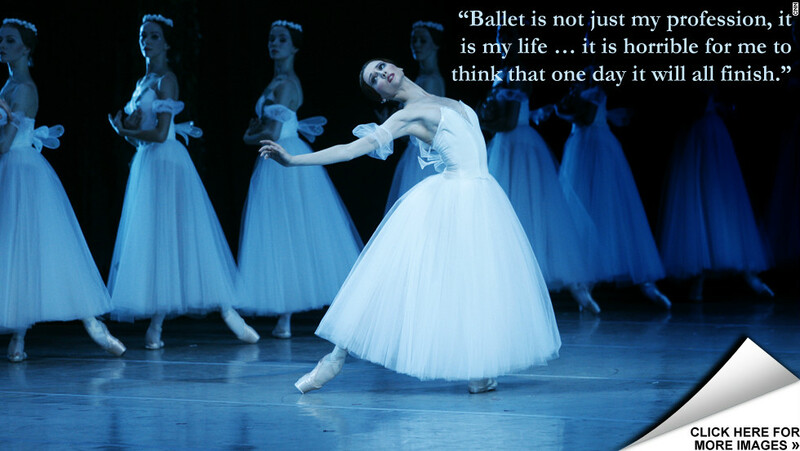 "Ballet is not just my profession, it is my life ... It is horrible for me to think that one day it will all finish."